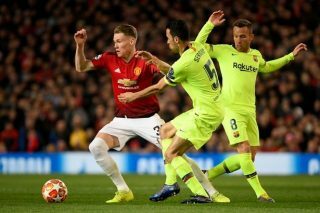 It is going to take something special for Manchester United to overturn a one-goal deficit against this Barcelona side at Camp Nou tomorrow night. The La Liga champions were not as dominated as many feared at Old Trafford and there are encouraging signs to take from the first leg. United may not have had any shots on target throughout the game, a stat that may seem baffling, but they still recorded more shots in total than their opponents, who won the game thanks to an own goal. By no means is the tie dead. It’s just very unlikely that we’ll see United pull off exactly what they did against Paris Saint-Germain, albeit with a greater deficit after losing the first leg 2-0. Manager Ole Gunnar Solskjaer knows all about pulling off miracles at Camp Nou. We, as fans, fondly recall his late winner against Bayern Munich in the same stadium, which saw United crowned European champions in 1999, the treble-winning season. He will demand a similar spirit from his players on Tuesday night — to not give up and to make life difficult for Barcelona. Ousmane Dembele started in Barcelona’s 1-1 draw with Huesca on Saturday and is expected to feature on the bench against United. A number of star players were rested for the game, including Lionel Messi, Philippe Coutinho, Nelson Semedo, Clement Lenglet, Sergio Busquets, Gerard Pique, Jordi Alba and Luis Suarez. Luke Shaw is suspended for the tie but still travels to Barcelona with the squad, as does Sir Alex Ferguson which should give the dressing room a boost. Marcus Rashford started from the bench at the weekend against West Ham, but the Reds had to call upon the young Englishman, yet again showing a reliance on a 21-year-old. Alexis Sanchez has been tipped to feature by Solskjaer, who didn’t include the Chilean in his weekend squad. This could be a golden opportunity to hit back at doubters against one of his former clubs. The fact Barcelona weren’t at their best and still won the first leg puts a bit of a downer on this… United were encouraging but lacked a cutting edge in the final third. United will try to keep Barcelona out for as long as they can, but we must take risks and win the game however difficult it may be. It just seems too big of an ask for this United side.